Improved Variable Product Attributes for WooCommerce is a plugin that improves attributes selection in your shop. Improve your customer product selection, set up your shop attribute styles and never show the Out of stock option. Use Text, HTML, Images or Color to show product variation selectors to your customers. Add a unique style to your web shop now and amaze your visitors and clients! Display your improved attributes on the single product pages as well as on product archive pages! Let your customers select the attribute variations on the product archive pages and add them to the cart using AJAX, without having to enter the single pages, or use the plugin to display attributes on product archive pages. Custom attribute names and attribute descriptions are supported! Check the demo at this link. WooCommerce 3.x.x+ Ready! Documentation and guide → Click here! All files are ready for translation. The WPML translation plugin is fully supported! Add Attribute Customization for each language separately. Translate all your attribute options into any language, including tooltips, attribute name overrides and custom attribute descriptions. The plugin comes with .MO and .PO files included. Spanish language file included. + Improved Product Options for WooCommerce 4.5.2 - 24. January 2019. - fixed _run_price problems, no custom options and price display issues etc. + Improved Product Options for WooCommerce 4.5.1 - 20. November 2018. + Improved Product Options 4.5.0 - 2. November 2018. + Improved Product Options 4.4.2 - 25. October 2018. + Improved Variable Product Attributes 4.4.1 - 21. September 2018. + Improved Variable Product Attributes 4.4.0 - 10. August 2018. + Improved Variable Product Attributes 4.3.0 - 25. May 2018. + Improved Variable Product Attributes 4.2.1 - 5. May 2018. + Improved Variable Product Attributes 4.2.0 - 21. April 2018. + Improved Variable Product Attributes 4.1.1 - 31. March 2018. + Improved Variable Product Attributes 4.1.0 - 18. March 2018. 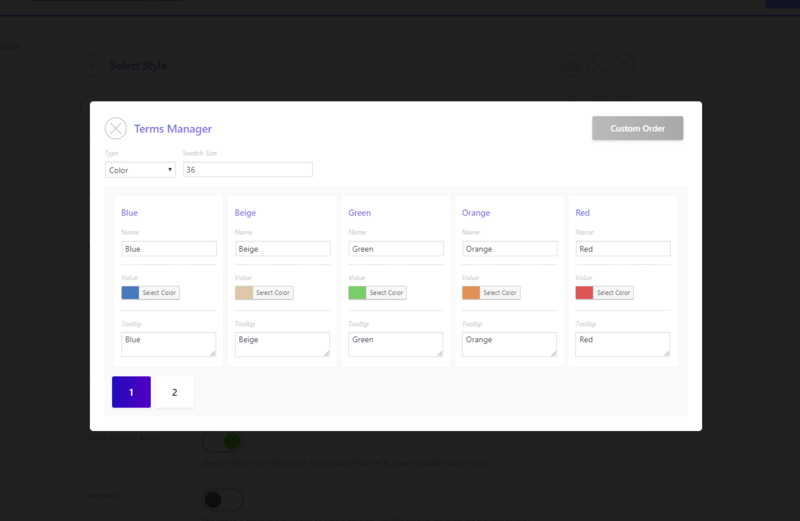 - added completely new admin panel! developed to suit the performance and precision standards of all Mihajlovicnenad.com plugins! you will love it <img src="/images/smileys/happy.png" alt=" :)" title=" :)" /> expect quicker load times in all WP pages! + Improved Variable Product Attributes 4.0.6 - 9. February 2018. + Improved Variable Product Attributes 4.0.5 - 8. January 2018. + Improved Variable Product Attributes 4.0.4 - 20. December 2017. + Improved Variable Product Attributes 4.0.3 - 12. December 2017. + Improved Variable Product Attributes 4.0.2 - 21. November 2017. - fine tuned some specific theme installations, check yours! + Improved Variable Product Attributes 4.0.1 - 3. October 2017. + Improved Variable Product Attributes 4.0.0 - 21. September 2017. 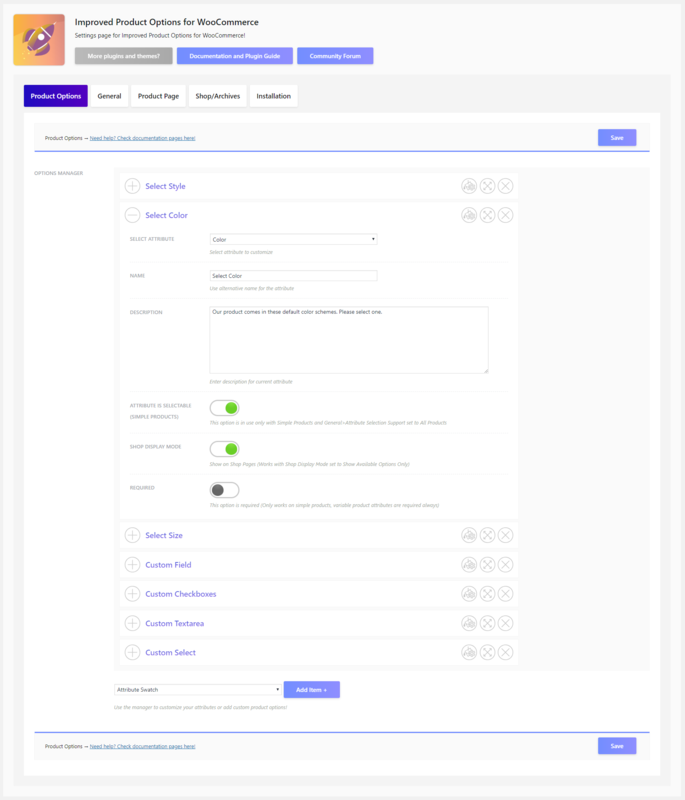 - added custom input, textarea, checkbox, system selectbox options! - added custom thumbnail, color, html, selectbox, plain text options! - added custom options add on prices! full support for using grouped and child options! - added multi select on thumbnail, color, html and plain text custom options! + Improved Variable Product Attributes for WooCommerce 3.3.1 - 17. August 2017. + Improved Variable Product Attributes for WooCommerce 3.3.0 - 20. June 2017. + Improved Variable Product Attributes for WooCommerce 3.2.4 - 10. April 2017. + Improved Variable Product Attributes for WooCommerce 3.2.3 - 9. April 2017. + Improved Variable Product Attributes for WooCommerce 3.2.2 - 20. February 2017. + Improved Variable Product Attributes for WooCommerce 3.2.1 - 21. December 2016. + Improved Variable Product Attributes for WooCommerce 3.2.0 - 17. October 2016. + Improved Variable Product Attributes for WooCommerce 3.1.1 -- 27. October 2016. + Improved Variable Product Attributes for WooCommerce 3.1.0 -- 22. October 2016. + Improved Variable Product Attributes for WooCommerce 3.0.2 -- 20. August 2016. - added stepped attribute selection, now your attributes can be selected one by one! + Improved Variable Product Attributes for WooCommerce 3.0.1 -- 22. June 2016. + Improved Variable Product Attributes for WooCommerce 3.0.0 -- 20. June 2016. - added function for changing images when not all attributes are selected, for both shop/product archives and single product pages! - added option caching for best performance! - added shop/product archives product quantities! + Improved Variable Product Attributes for WooCommerce 2.6.1 -- 14. May 2016. + Improved Variable Product Attributes for WooCommerce 2.6.0 -- 11. May 2016. + Improved Variable Product Attributes for WooCommerce 2.5.1 -- 17. March 2016. + Improved Variable Product Attributes for WooCommerce 2.5.0 -- 14. March 2016. - added automatic updates! enter your purchase code, register the improved variable product attributes and get automatic updates in a single click directly from your wordpress dashboard!